A caryatid is a sculpted female figure serving as an architectural support taking the place of a column or a pillar supporting an entablature on her head. 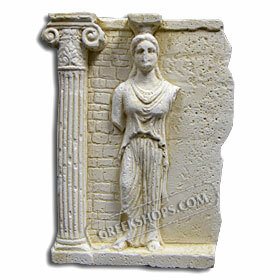 The Greek term karyatides literally means "maidens of Karyai", an ancient town of Peloponnese. Some of the earliest known examples were found in the treasuries of Delphi, dating to about the 6th century BC, but their use as supports in the form of women can be traced back even earlier, to ritual basins, ivory mirror handles from Phoenicia, and draped figures from archaic Greece. The best-known and most-copied examples are those of the six figures of the Caryatid Porch of the Erechtheion on the Acropolis at Athens.